The SP20 Series Soil Pulverizers loosen, pulverize, and level packed or encrusted soils in preparation for seeding or laying of new sod. The 60" working width of the SP2060 is well suited for use by landscapers, rental yards, construction contractors, and professional turf managers. Applications include golf courses, housing developments, athletic fields, nurseries, sod farms, transportation right-of-ways, and park systems. Replaceable heat-treated sleeves: Heat-treated replaceable sleeves on roller protect spike. Easily replace the sleeve when worn vs. replacing entire spike. 3/8” Steel spikes welded to the roller’s surface: Spikes are welded to the roller’s surface rather than to a hole. Damaged spikes can be cut off and replaced. Self-aligning bearings with double lip seals on rear roller: Self-aligning bearings conform to the roller and shafts. 1” Diameter shaft in roller: Heavy shaft can handle the shock loads from the roller. 10 1/2” x 2” x 2 ” Scarifier teeth: Scarifier teeth are heat-treated for long life and can be reversed when one side wears down. Fits Land Pride Quick-Hitch: Cat. 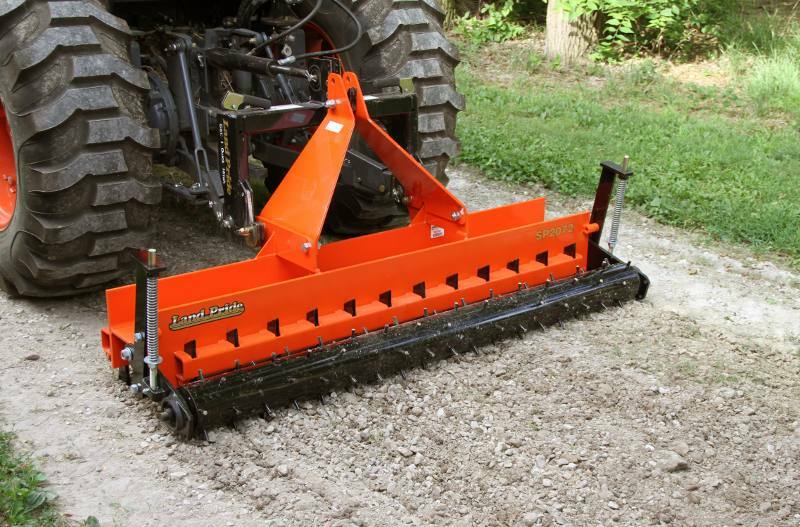 1 3-point fits Land Pride Quick-Hitch for easy on-off with one person. Overall Width: 65 1/4 in. Front to Back Length Single Roller: 25 1/2 in. Shank Spacing: 2 13/16 in. Springs - Front Roller: 32 lb./in.